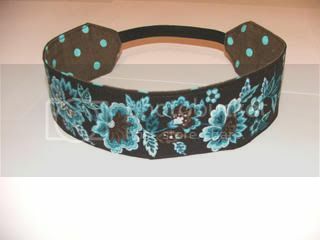 I've added a new category to my new etsy shop http://www.jtstitches.etsy.com/, "Headbands". I've been making them for myself for a while so I decided to make them for you all to enjoy. I will be adding more but if you see a pattern you like let me know, you can see my "Fabrics" HERE. This one is my favorite, I love the colors. You can see more pics HERE. I love wearing headbands, especially to work. I'm a nurse & at work I have to wear my hair up. I have a lot of hair & I get a headache after it's up for a while (I work 13 hour shifts). For me headbands help with the pressure when I have a ponytail or bun. It holds some of the weight underneath the ponytail so all the weight isn't in one spot & pulling the front of my hair back. It also helps hide those annoying "baby hairs" on the top that frizz up in the rainy or humidity. Plus, it's a hot little accessory! I also do embroidery so if you would like a personalized headband, a certain design or certain color combos you can't find let me know. Visit my website http://www.jtstitches.com/. Have a great week!